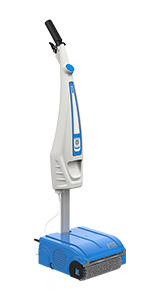 Thanks to its innovative and modern design, the Floorwash F25 floor cleaner has been developed to exploit the entire cleaning surface, guaranteeing incredible results in a single sweep, even when faced with stubborn dirt or difficult-to-reach areas. Floorwash knows no obstacles! Thanks to the tank with a tilt angle of 90°, it is possible to reach the most difficult areas: under furniture 14 cm high. Floorwash is for everyone! Thanks to the practical height-adjustable tank, you can select three different positions, for everyone's comfort. 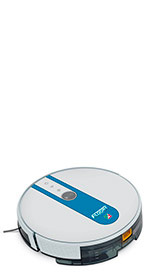 Floorwash is equipped with two rear rubber wheels, simply tilt Floorwash towards you for safe and easy movement. Use the practical slot in the external tank for transport between different floors. Quick and easy! 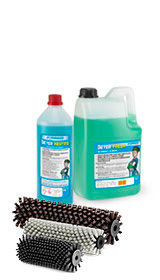 With Floorwash it only takes a few minutes to change the brushes, simply press on the left side to remove the pins that support the brushes, make the change and reinsert the pins in the opposite direction. Floorwash’s innovative front brush allows you to effectively clean along the edge of wall and reach the most difficult corners. The off-centre position on the right, puts the tip of the brush only 5 mm from the edge overhang. 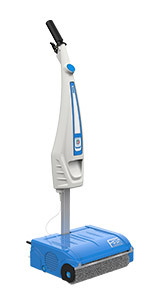 Two cylindrical brushes, front and rear, ensure that every surface is perfectly cleaned, fully recovering any type of liquid present on the floor. 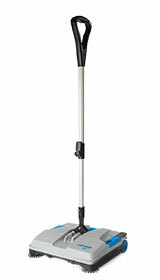 Floorwash's effectiveness comes from the high opposite rotation speed of the brushes, allowing the roller to carry the dirt inside the recovery tank. The new recovery tank is semi-closed, which prevents "dirty" water from leaking out while using Floorwash. The scraper blade is welded to prevent possible breakage. The lever used to dispense water is placed under the handle for maximum comfort. It is possible to "measure" the quantity of water dispensed according to the surface specifications. 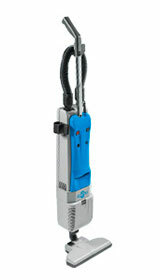 This makes Floorwash an electronic tool able to clean any type of surface, including parquet. All our machine components are manufactured to meet quality, safety and comfort criteria. All the materials used for the production of our machines are studied to determine the necessary characteristics and conformity.